Oysters - coming in two different flavors. My friend had the one with sake granita while I took the one with lemon foam. I really liked this. There was plenty of acidity, but also sweetness so it wasn't all one-way - kinda like having lemon sorbet. There was also caviar here. By the way the fermented beer soil didn't taste like beer to us, even though Uwe mentioned something about Oktoberfest... If anything it may have tasted a little like malt, and was savory in general. Scooping the occasional spoonful into the mouth together with some of the seafood seemed to provide interesting results. Pebbles - we were told some were real but others merely looked like pebbles. We were able to distinguish them by poking a couple with our forks. Razor clams - diced razor clams were served on a bed of soil, along with fennel, dill and dill flowers. Lovely both in terms of presentation as well as flavors. 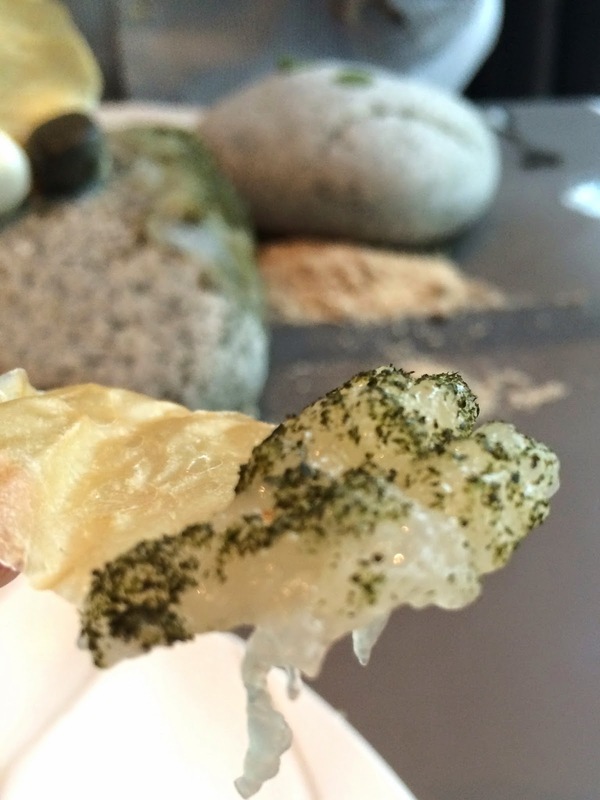 Lobster tartare - After the first round of rocks, Uwe brought us a new one, and this came with a layer of lobster tartare smeared on one side, sprinkled with powdered seaweed. We were to grab one of the paper-thin chips made from scallops, and scrape the lobster off the rock. That way we could have both lobster and scallops in the same mouthful. Definitely very interesting... and once again we're playing with our food. Cured salmon - Uwe described this as a cross between gravlax and smoked salmon, where the salmon is first cured, then cooked, and finally smoked. Served with salmon roe, caviar, spinach, and sprinkled with freeze-dried seaweed powder. Langoustine - fresh and tasty, and perfectly done. Interestingly served with a dab of sauce that seemed to be made of the langoustine tomalley. Yum. Clam chowder - we were presented with these two-layer contraptions and the chowder was poured into the top layer. The liquid slowly drained through holes into the bottom cup, while the tiny vegetable balls remained. Curiously, there were no clams in the clam chowder... but it was tasty nevertheless. With that, our trip to the seaside was finally over. It was time to move on to a seasonal ingredient - white truffles from Alba. Macaroni: handmade, mushroom, cream, white truffle - Uwe brought out a bowl of mushroom macaroni, then mixed two duck egg yolks into the bowl - creating that golden hue. Then came the white truffle shavings. Uwe said the quality of his current shipment is the best so far, and it really showed. The fragrance was simply incredible. Together with chanterelles and ceps, I felt like I was in mushroom heaven. Thankfully that was the last of it. Both of us were really full, and there was only room for some madeleines. We each got a "regular" as well as a chocolate madeleine, and both were delicious. We even got one to take back to the office.